Back to school for the kids, and back to Michael's for the media set. It’s back to school and the cool kids have returned to the cafeteria! The media mob was out in force at Michael’s today despite the soul crushing heat. 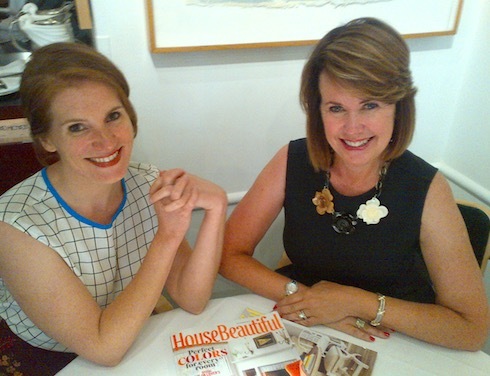 I was joined by Sophie Donelson, editor in chief of House Beautiful since January of this year. The tireless and terrific Alexandra Carlin, Hearst’s vice president of public relations arranged our tête-à-tête. As a longtime fan of the magazine and a homeowner who gets completely overwhelmed at the prospect of having to buy living room curtains, I was eager to get Sophie’s point of view on how she makes the daunting task of decorating without divorce. After discussing the finer points on how to get your spouse to sign on to your design choices with the minimum amount of angst –“You’ve got to know which rooms are important to you, focus on those and let him have his own space,” counseled Sophie, we got down to business.